Before starting our talk about a new model let's look at the events of this year concerning Siemens. 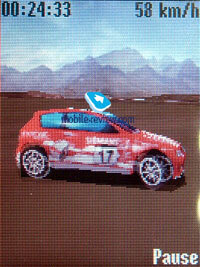 The main one is undoubtedly CeBIT where the new models of the 65-generation were introduced. We reported about them much and in details that's why we'll point out only the most interesting ones. 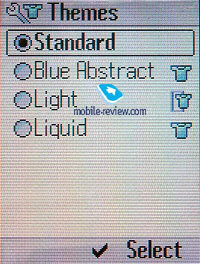 They are a classical middle / low-end device C65, a business phone S65 and a model for active lifestyle M65. Altogether that is 8 models. We won't speak about the sales of the 65 series but will note that the majority of the devices hasn't gone through their "children diseases" and speaking about the results will be evidently possible only in the beginning of the next year when the data on 2004 appears. 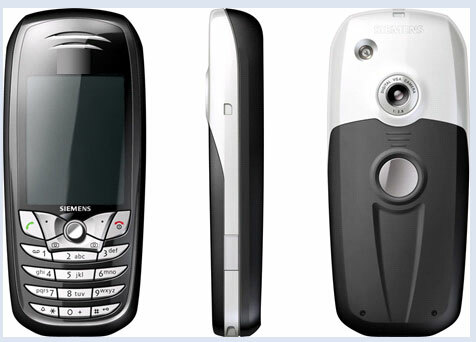 And anyway Siemens didn't wait for the next year to introduce its 70-series phones and is trying to do it now. As a result the information about CX70 appeared. 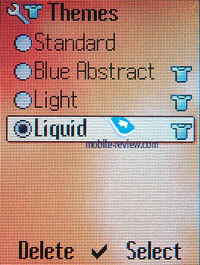 This device is our today hero. You may ask where the exclusiveness is. The fact is that during the official presentation of the model an old version was introduced. We'll remind that on Siemens press site photos of CX70 are available and they do not differ from CX65, only another body and the colour of the keys. And that is all. 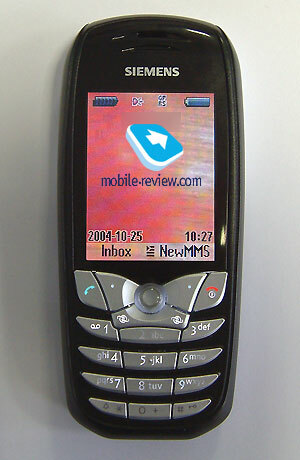 But Mobile-review.com got the real CX70 (earlier known as Butterfly Concept) that was not displayed in public before. So, ladies and gentlemen, let me introduce CX70. What are the facts telling it's the real CX70? First, that is many notes on the label under the battery. We had such cases when the name of the model changed just before the sales started but no any mobile phone with a renewed design had the same name as already existing one. Second, having connected the device to a PC via IrDA we got sure it is identified as CX70 (that is not a real proof because S65 had the same software as CX65, but the fact is interesting). So, the software is also labeled as CX70. 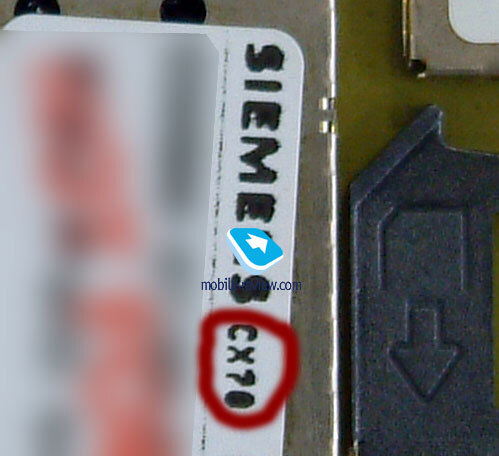 We also checked the IMEI number of the phone and found that magical letters CX70 in a Product section. And third, we'll give our thoughts concerning the product. Creating a model very similar in appearance to another device by the company is very risky from the marketing point of view. Even extremely risky. Advertising the device it will be impossible to draw attention to the design because it has already been seen and it will be hard to explain the technical differences between the two models. 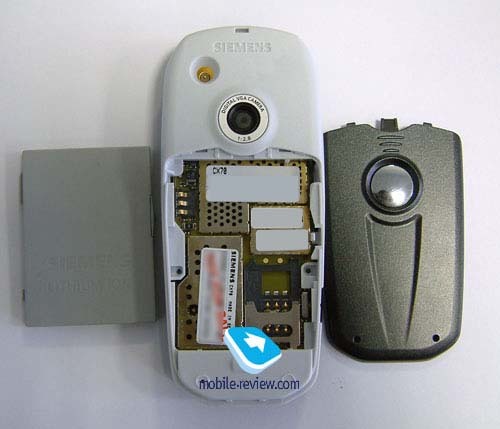 Thus it gets clear that Siemens tried to make another appearance of the device just at the last moment after the presentation. The main difference between CX65 and CX70 is the key form, body colour and some software changes connected with integrating a more powerful graphical processor. The dimensions and weights are completely similar. 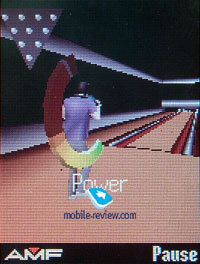 The screen also remained the same, the same advantages and disadvantages. Let's begin with the buttons. In CX65 their form resembled a shield and CX70 has a completely different one. 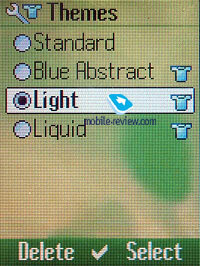 The block with numbers resembles the one in S65 but control buttons under the screen have another form. A navi joystick is similar to CX65 and a fast Internet access button is under it. 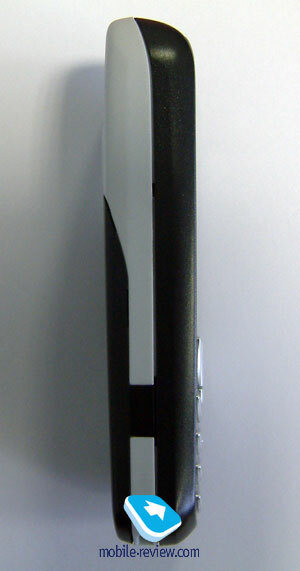 The same button may be found under a joystick in Siemens S65. All the buttons are silvery and the backlighting is white. 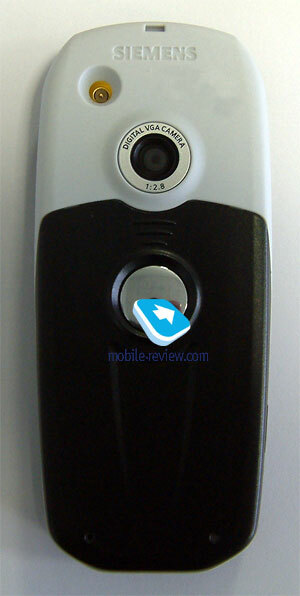 Speaking about the comfort of the keypad we should admit that the keys are comfortable to work with. The only criticism is that "2" button is too close to the hot button. 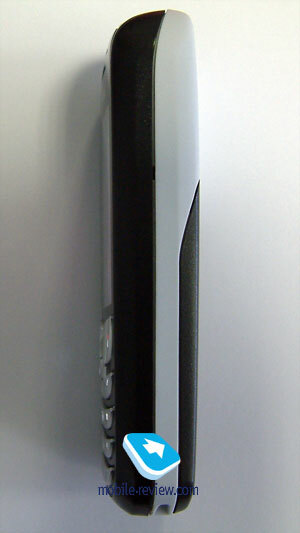 An unnecessary key is often pressed while working with the device. The keypad is not comfortable to the ones with large hands, they have to press the keys with nails but not a finger-pad. The back panel resembles Siemens CX65 much but has one significant difference. There is a large mirror for portraits on it. When seeing the back panel of Siemens CX70 for the first time associations with a mythological hero Cyclop appear unwillingly. And now about the changes in software. As we have mentioned above one of the main differences between CX65 and CX70 is a support for 3D animation in the new model. A user may feel this just after turning the phone on, an assistant, a Phone Pilot, appears, it may look like a man, a mysterious creature or a well-known smile. You may choose the loveliest one. 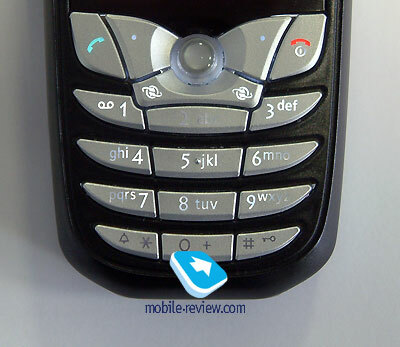 When the phone is not in use for more than a minute and the keypad is not locked, the assistant tells about the phone capabilities in a light and clear form, for instance, about sending and receiving MMS. It's hard to say the assistant is useful or not, those users who don't go deeper into mobile technologies will probably get interested in it. Those ones who understand something in mobile phones will soon get sick and tired of it. All the three heroes are well animated, they turn, run and attract attention in other ways. Fortunately, the Phone Pilot function may be turned off. 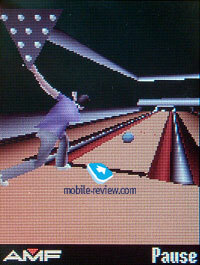 Keeping on the talk about the 3D animation let's consider two preinstalled games. 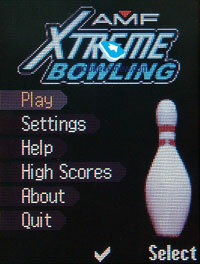 The first one is AMF Xtreme Bowling that offers to roll some balls on a bowling line. I should admit the game looks well and interesting thanks to the 3D animation. 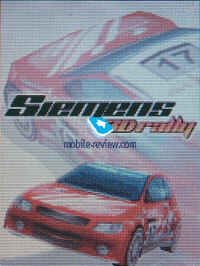 The same may be told about the second game Siemens 3D Rally that is a classic rally simulator, as you may have already understood. However controlling is more difficult because of the small keys. Summing up told above we'd admit the improvement of the graphical processor was good for the entertaining capabilities of the phone. Three new design solutions of the menu are available, they are rather interesting and nice. Unfortunately, we couldn't check the Push-to-Talk function since Russian operators provide no support for it. 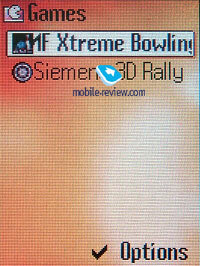 Summing up I'd like to say that is the first time the 3D animation that appeared in the phones by Siemens not so long ago works well and there are no troubles with operating speed. 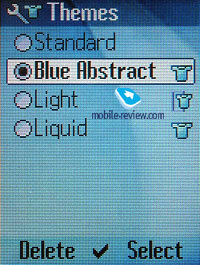 Animation is widely used in the phone and that's really good for the menu and the whole perception of the phone. We can't say anything about the Push-to-Talk function for the moment but there is no reason to expect any problems with it. The talks about the inclusion of a flash into a standard kit still remained only the talks, it's necessary to buy it separately. The beginning of the sales is expected just before the New Year holidays, the expected price is 250 USD. After the New Year the price will decrease but not critically. It's hard to expect any great sales, a customer should be attracted with a new design, but even the functions remained the same as in 65. Of course, there are some improvements but we really doubt they will attract many customers. P.S. 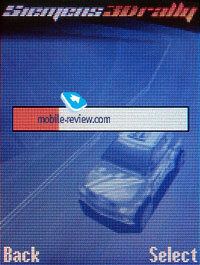 Just before the release of this review we got some new information. The model will probably be sold in two versions, the first is told about in this article and the second was announced earlier. But this information is unofficial. The only thing that's clear is that CX70 just told about will certainly be sold. It's not clear if the model of an old design will also be sold.